Una vacanza unica in un appartamento con una camera da letto proprio sulla spiaggia. Le scale si dirigono direttamente alla piccola spiaggia. Anche un sentiero pedonale anteriore dell'appartamento dirige verso il villaggio Kiveri il villaggio dove si possono trovare taverne, caffè, supermercato, panificio, drogheria, macelleria, farmacia e. t.c. Appartamento situato nel villaggio di Kiveri, un villaggio tradizionale del mare, a pochi chilometri da Nafplio, Argos e il sito archeologico di Argolis come Mycenae, Epidaurus, Tiryns. Appartamento conist di, una camera da letto separata, un soggiorno e bagno con doccia. L'appartamento può ospitare 4 persone (2 adulti + 2 bambini). Appartamento ha il proprio balcone con vista sul mare unico nel golfo di Argolis. It was a very perfect time!! The Appartement is really perfect! Christos, the owner was there when we arrived to welcome us. The Appartement is very nice. We missed nothing!! Sitting on the balcony and having breakfast with a wonderful sight to the other side of the bay of Nafplion in the rising sun is beautiful. Some days this year late April (when we were there) the temperature was little low, but the Appartement has heaters (and Airconditioner) - so we could warm it up! The location is perfect for visiting a lot of Archeological and other interesting places. There is a good Fish-Restaurant nearby (Kanaris) where you can have a good dinner!! In total we wissen nothing in and around the Appartement!! So definitely we would come back!!! This is our third stay at this property over the past several years. Need I say more? We had a great stay in this lovely apartment and enjoyed the panoramic view on the Argolis gulf with its fisherman's boats. The apartment offers ample space for couples and is tastefully furnitured. The well equipped kitchen is very suitable for people like us who love cooking. The bedroom was quite spacious and provided with comfortable beds. The apartment was kept tidy on a regular basis, which was highly appreciated. 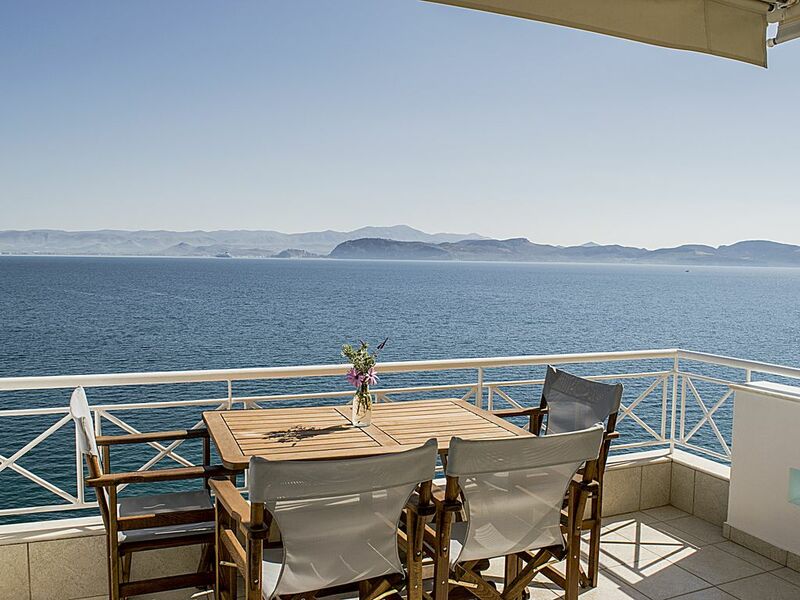 We loved relaxing in the cosy seats on the balcony with the amazing view on the sea and the surrounding coastline. We were very happy to be able to use the large built-in barbecue a few stairs away from the apartment. On many occasions we went to the fish reastaurant which was only a five minutes walk, where we enjoyed the fantastic Greek cuisine. Christos and his mother were prepared to help and advize anytime necessary. All in all we had a wonderful time here! Couldn't have wanted more - ideally placed near Argos, 2 minutes to the beach and swimming, spacious and comfortable, wifi, aircon, and a terrace view of the bay. The owner's mother lives on the floor above, she speaks good French so help is always available. Parking is available immediately by the entrance. Thanks Christos. It is real a beautiful apartment, well equipped and very clean. The balcony over the sea with the unique view is the hot spot of the apartment. Only few steps drive in a small beach front of the apartment. In a walking distance all the shops and restaurants. Apartment is located close to Nafplio 15min away. It is in an ideal location if someone want to relax on the sea and to visit all the monuments in Argolis. We had a really great stay. The scene from the place is absolutely beautiful. Clean, comfortable, and quiet. The location was lovely, overlooking the beach and sea. The apartment is located in a quiet village with a supermarket and several restaurants. Highly recommend!